• Choose A Size Below: 24", 33.5" & 47"
Availble sizes in width 24", 33.5", 47" all sizes are available in 78" or 90" high. 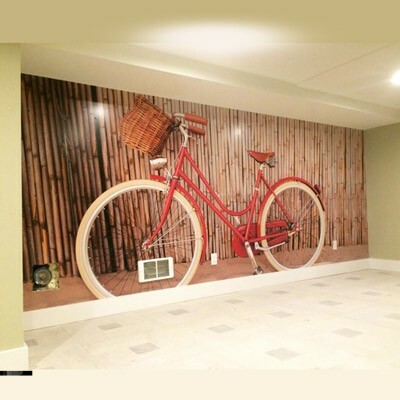 Artwork should be set at 400 DPI at a 1/4 the size, no bleed is required. Banner Size 24" x 78"
File size 6" x 19.5"
File size 8.375" x 19.5"
File size 11.75" x 19.5"
File size 6" x 22.5"
File size 8.375" x 22.5"
File size 11.75" x 22.5"
Imagine going to a show and you don't need to worry about decorating your booth! 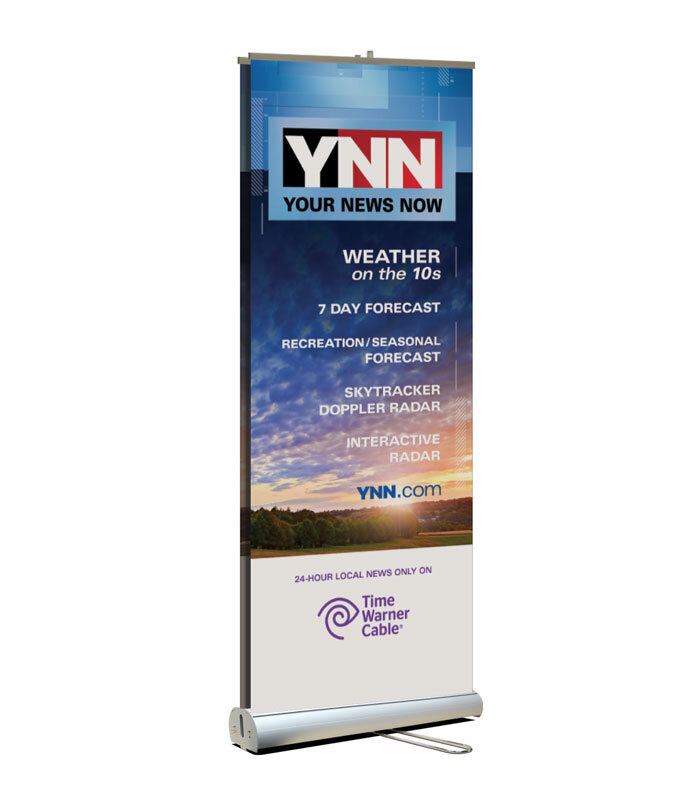 This double sided retractable banner stand will help you achieve you're marketing goals by attracting both sides of traffic, the print rolls into the base and it's a free standing banner, it takes up no space from your booth and big enough to attract traffic at your event, also convenience for presentations, conferences and retail stores. The banner is printed on high quality 11 mil polyester fabric, its smooth finish on a bright-white matte base offers exceptional image quality, the fabric stays flat and won't curl ever, even for high volume usage. That is correct! You can use our banners multiple times. 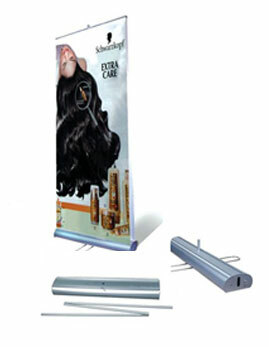 Traveling to a trade show this is the right tool for quick and easy display, it sets up in a minute, and your message is displayed, the banner stand is compact packed in a black nylon case for easy traveling. What is Retractable banner double sided? Double sided retractable banners are one of the most popular forms of advertising, mostly used at exhibitions, trade shows, corporate or personal events and even at retail stores. Businesses or individuals use them as part of their event promotion strategy for many reasons – they are light weight and portable, easy and quick to setup, durable and reusable (only if printed on quality fabric). 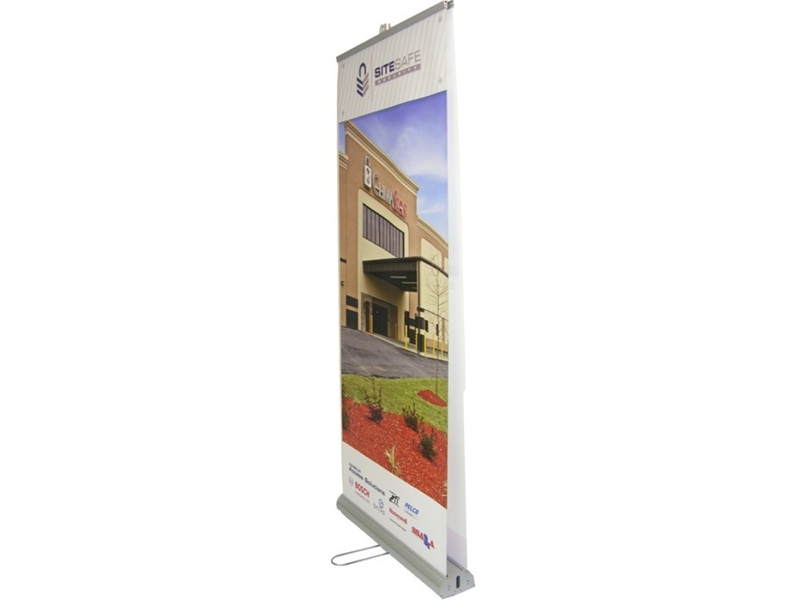 Retractable banner is available both as single sided or double sided. They are also well known as - pull up and roll up banners. 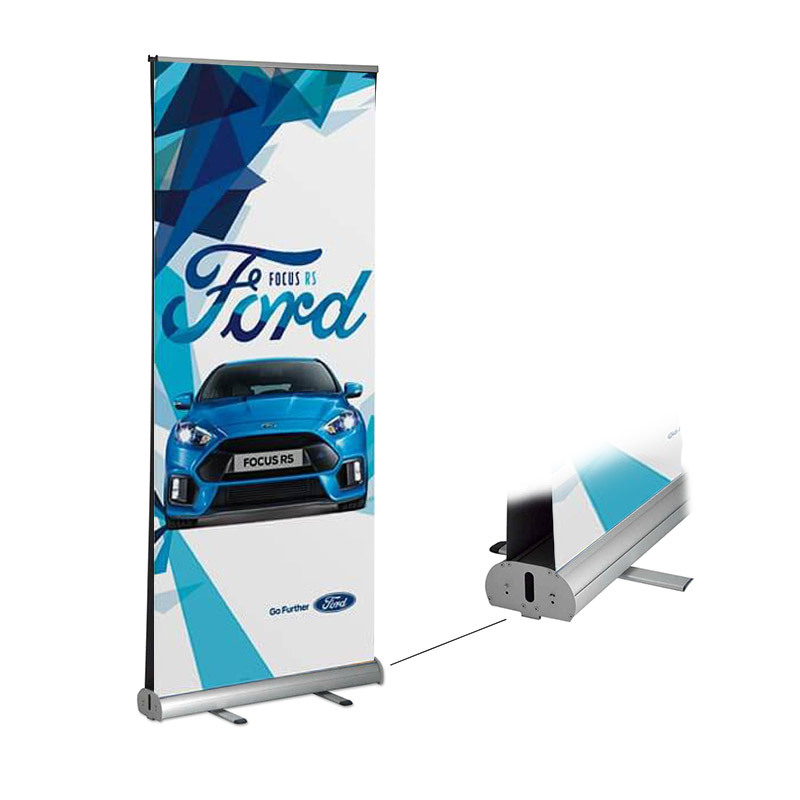 As retractable banner double sided offer much greater exposure and set the perfect stage for attracting your customers from both opposite directions. 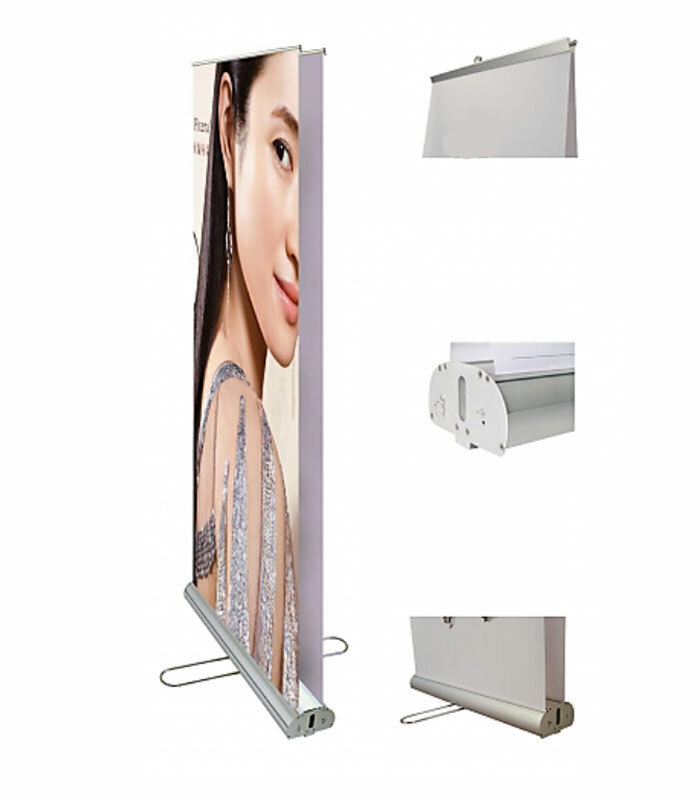 Double sided pull up banner play great role in optimum positioning and attraction, which are very first step towards creating a sales funnel or opportunities at an exhibition. Low Cost: they are relatively low cost, as compared to other form advertising displays. 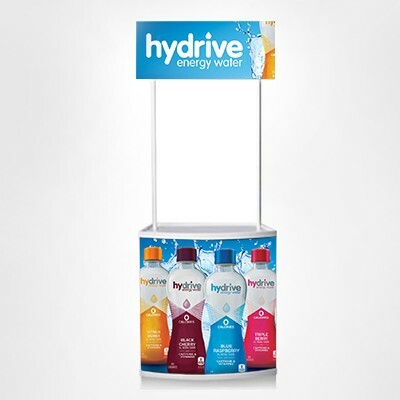 Visibility: By using double sided pull up banners or double-sided retractable banners (however you may call it, but it’s the same thing) at trade shows and exhibitions, a two-way display of your message or custom artwork will attract the potential customers to your booth or special event. And they are big enough to advertise your message clearly and professionally. Popular sizes we carry by width are 24", 33.5" & 47", and based on how BIG you want your display to be, you can order them in 78" (6.5 feet) or 90"(7.5 feet) Height. Portability: Since they are light weighted, the transport cost is next to nothing. 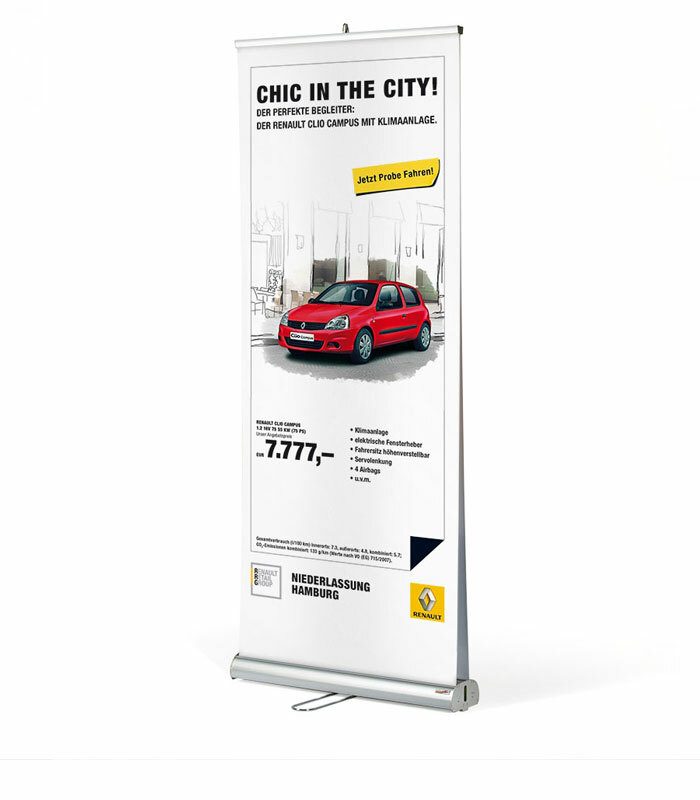 These double-sided pull up banner collapse into its own base and can be easily packed and carried in the carry bag which we include with your order and can be taken from one event to another inside your car, overhead storage compartment on planes or trains or at the back of your truck. Durability: The quality fabric we use (11 mil fabric), its smooth finish on a bright-white matte base offers exceptional image quality, the fabric stays flat and won't curl EVER!, That is what makes our double-sided retractable banners durable for multiple usages, so you spend once and re-use it over and over again. Print Quality: With years of experience in printing banners and working with thousands of customers, we understand how important your event is to you. Therefore we guarantee that we give you the best printing quality and material, ensuring 100% satisfaction. We use best in class high-resolution printer, quality fabric and our experienced technicians, ensures that your custom artwork is printed to its perfection, hence ensuring that you are not let down at your event. Where all can you use double sided retractable banners? Business tradeshows: These banners make a terrific addition to your stand in trade shows as they provide a great focal point for all those who are attracted to your booth. Retail Stores/restaurants / cafe: The double-sided retractable banner are becoming very popular for promoting any new product launch, special offers or even a new menu. You can quickly display them in busy markets or malls and attract footfall to your stores or restaurants. At your corporate or personal event: If you are hosting any corporate or personal event or work party, there is no better attraction than a double-sided retractable banner. Put a couple of banners at the entrance and exit of the event which will draw the invitees. Conferences: In case you are planning to sponsor a conference, or you have people who will be speaking at multiple times throughout the conference, then it is vital to have a double sided pull up banner that gathers visibility for your company brand amongst the conference attendees. Our roller banner stand usually ships 2 business days after artwork approval, there is always a chance to ship even earlier depending on our workflow on that day, if you need it sooner select rush and it will ship the next business day, or contact us to see availability and how we can help you get your stuff on time within your deadline. Standard 2 bussiness day turnaround is up to 6 quantity, for more quantity it can take longer, please contact us to check tunaround. Rush orders is up to 2 quantity, if you need to get more please contact us to see availability. 50 W Hologan light to brighten up your graphics. Select add a light on the page. You will need 2 lights for both sides of the double sided stand. 1) Turn out the leg from the bottom of the stand. 2) Locate the telescoping pole from the base of the stand and put it in the hole of the stand, make sure it sets firm in the bottom of the stand. 3) Put your feet on the legs of the stand, pull out the graphics until it reaches the top of the pole and hook it up, repeat for the other side banner!